Please note that these are not universal liners. They are designed specifically for the Pamela Crawford Side Planting Baskets. The liners for my window boxes fit well and I cannot wait to plant my flowers in them. I love the quality and unique items. This item is a reorder. It's great for my window box that I ordered from Kinsman. I thought the last time I ordered it the holes could be punched out if I preferred. I plugged them up but would have liked to have had the choice. Still like this product. This is my fourth season using this planter and I couldn't be happier. The first liner held up through three years and the new line has a slightly different design on the side planting holes which makes it easier to insert the plants. My "garden" is a small 10th floor balcony that only gets morning sun. I use this planter on a stand against a blank brick wall, which softens the appearance. 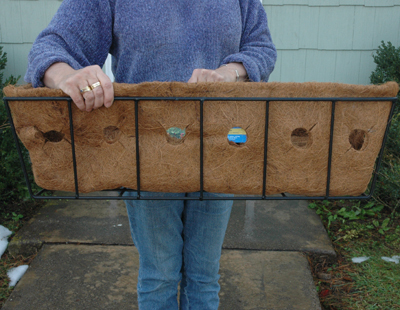 I have to use Lechuza self-watering Balconera planters along the rail as the downstairs neighbors object to the slight drips coming off of the coco fiber planters, otherwise I would be hanging these off the rails too and going wild with trailing displays in the side holes. What a great idea! We have two 44" window boxes under our living room window. It's a completely shaded area except for about an hour of early morning sun. We plant 34 impatience and are treated to a riot of jolly color and rich foliage from early summer to the first big frost in the fall. We find we have to replace the liners about every four years - which is a very acceptable cycle. Kinsman has supplied every liner since we started - they are the best.